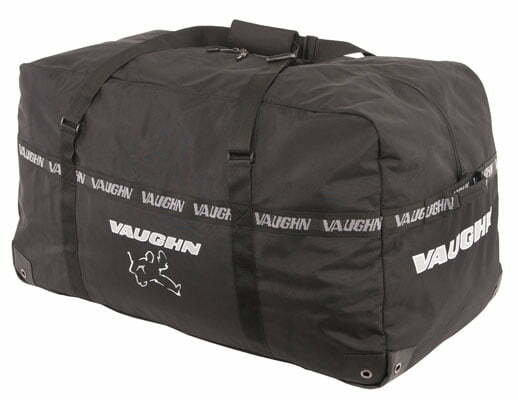 Vaughn Hockey Goalie Carry Bag | Sports Etc. The 1100 goal bag is super-sized to hold an entire set of adult size equipment. The bag features extra heavy 1680 denier nylon construction with all internal seams double stitched and bound for added strength. Large number ten coil zipper for added strength and allows the bag to be fully opened for easy access. Heavy duty webbing reinforces the sides and ends of the bag. Large nylon carry handles with box stitched reinforced seams for durability and reinforced hand grasp handles at each end. Reinforced bottom corners with air vent grommets add durability and strength to the construction. The entire bottom surface of the bag is double layered for added strength and water resistance. Great for all ages.